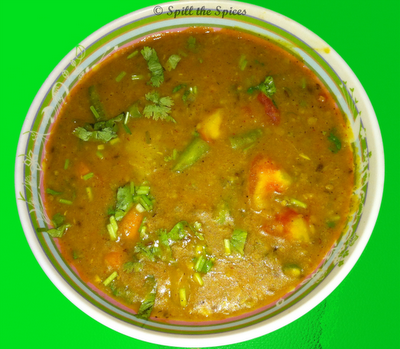 A combination of toor dal and moong dal flavored with aromatic spices and with the addition of healthy vegetables like carrot, beans etc and the tanginess of tamarind paste. This dal goes well with rice and chapathi. 1. Wash the toor dal and yellow moong dal. Add 2 cups water, turmeric powder and mix it. Pressure cook the dal till soft. Mash and keep aside. 2. Dissolve the tamarind paste in 1 cup water and keep aside. 3. Heat ghee and add jeera, red chillies and asafoetida. Add ginger, garlic and fry for a minute. Then add onions, green chillies and fry till golden. 4. Now add beans, carrot, little salt and cook till the vegetables become soft. Then add turmeric powder, coriander powder, red chilly powder and garam masala. Sprinkle little water and fry for 3-4 minutes. 5. Add the boiled potatoes, tomatoes and mix well. Fry for 2 minutes. 6. Add the cooked dal, tamarind water, 1 cup water, salt and mix well. Bring to boil and boil for 5 minutes. Garnish with coriander leaves. Liked the addition of vegetables and tamarind extract to the dal...sounds delicious.